Kee Safety, a leading global supplier of safety railing systems, has expanded its KEE KLAMP range with the introduction of 12 new types of tubular fittings. Designed for installation on steeper gradients, the new slope fittings offer builders and specifiers an aesthetically pleasing option. The latest addition to the KEE KLAMP portfolio is an extension to the current range of slope fittings. 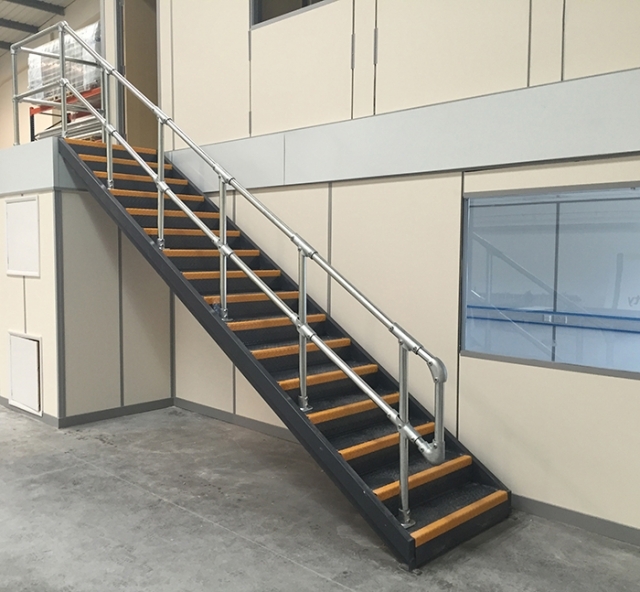 The new components have been designed to enhance the building of guardrail along staircases and ramps, particularly when the slope is greater than 30 degrees. The new range introduces single fittings to cater for situations where currently a combination of fittings is required. Not only does this improve the aesthetics of the finished guardrail but it also allows for a quicker and easier installation. Download the brochure with the new KEE KLAMP - Slope Fittings! KEE KLAMP is a range of cast iron tubular fittings that can be installed using a standard hex key. Each fitting incorporates an internal set screw to lock the respective fitting safely and securely onto the tube to create a strong, stable and safe structure. This method eliminates the need for time-consuming welding or specialist skills. Since no special tools are needed, workers can change and reconfigure Kee Klamp® structures quickly and easily. The KEE KLAMP system securely joins structural steel tube into almost any conceivable configuration across a variety of angles and is also capable of accommodating on-site variations. Order the new fittings now - for your new stair handrail!